One of the easiest and most convincing arguments that one can make right now is that US investors are abandoning stocks and flocking to the perceived safety of bonds. It is easy to point to the fund flows which show week after consecutive week of outflows for US equity mutual funds and gargantuan positive inflows for bonds. Since January 2007, US retail investors have cashed out an astonishing $262 Billion from domestic equity mutual funds and socked away almost $730 Billion into municipal and taxable bond funds. So it is understandable why someone looking at this chart would start to believe that the fabled US equity culture is over. Even after a brutal and decade long bear market, even after the “Flash Crash” that spooked many of the remaining US retail investors, after all the shenanigans that Wall Street pulled, US investors are still holding above average amounts of equities. Of course, the peak was in the first quarter of 2000, before the tech bubble burst. And there was another peak in late 2007, just before the latest bear market began. But all in all, US investors are hanging tough. But of course, in 1982 unbenownst to almost everyone, the great bull market had already began. Still, it took longer to heal the damaged psyche of the average US investor than to hurt it in the first place. Relative participation in stock holdings gained ground slowly every year and it finally overtook the peak of the roaring 1960’s bull market in 1998. In contrast, in this cycle US holdings dipped below the 55 year mean just momentarily in late 2008 during the darkest hour of the credit crisis. And since, they have sharply rebounded. If there is a secular shift taking place, because the sums involved are so vast, the trend in the first chart above would have to continue for a very long time before we see the kind of damage that occurred in the early 1980’s. Of course, we may get there. No one knows the future. 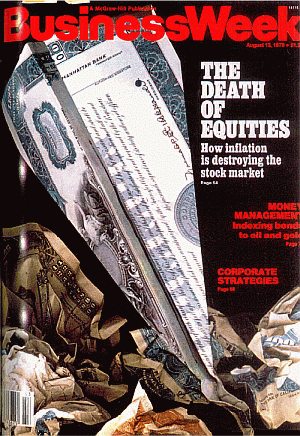 But it is more than premature to suddenly declare today the “Death of Equities”. And we may never revisit those lows. Perhaps those still in the equity markets are those who took the big hit after 2007/2008. Their portfolios were decimated, and they are hoping to some day breakeven. With interest rates so low, there is no place left to earn a decent yield. A lot of people are in markets because they have no other place to invest. Why not take the equity risk? The more people I talk to it really seems as if the smaller investor is terrified of equities. Recently, I’ve been telling anyone who asks me what to do in this market to wait. That’s it, just wait. There is no trend in equities right now. Stocks have moved sideways for about 3 months now. We might get some movement now that the Summer is over and the B-S-D’s have returned from the Hamptons. No reason to try to guess though. There will be plenty of time to get long some good stocks if/when an uptrend shows itself.